Camping, if not the most popular, is one of the most popular outings families take. Probably because it is just nice to be out of the house and sleep in the tent watching the stars shining above our head. And of course, you can camp with friends or just by yourself with ease. That happens when you have all the essentials for camping which includes a folding table! A folding table is manufactured to function just as an unfoldable table you have at home. But a folding table is lots lighter (you can even get one at only 2lbs!) which allows you to transport it easily from places to places even to the mountain. When purchasing a folding table, it is important that you take into account a few things such as material, dimensions, and weight. Material: To cut the weight of a folding table, companies try to avoid metal as it can be heavier than lightwood or bamboo or plastic which is not a bad thing. Bamboo makes production and consumption more sustainable while plastic makes it easy to clean up any stain. Stainless steel and aluminum also make a very good folding table as they don’t get oxidized by moist thus you don’t have to worry about keeping them in the rain as they wouldn’t corrode. They are durable with just a little more weight. Dimensions: How big would you like your folding to be? Think about the height that would suit people sitting around it. If it is for children, go for a shorter one. Though, if you are indecisive, go for the one that you alter the height as you like. The dimensions of the length and width will give you an idea of how many people can fit around the table. If you are intending to take it on a solo camping trip, it would be smart to get a small one to reduce packing weight. However, having a larger one with you might bring you a new buddy! 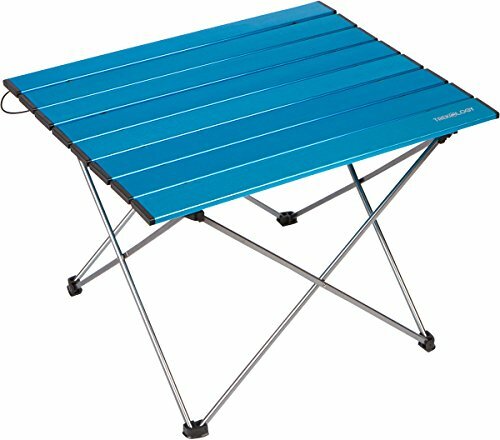 Weight: You should opt for a light folding table if you are planning to take it to your campsite every weekend. 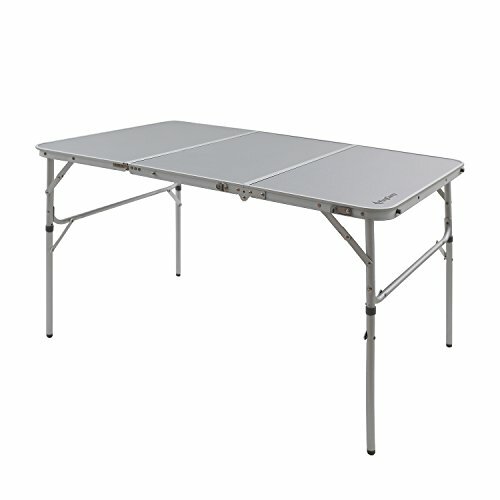 However, a heavier folding table might be more sturdy and have a stronger grip on the ground and strongly resistant to wind. Though, you can always tie the legs of your folding table to a rock to ensure it wouldn’t be easily knock down by the wind. We understand how shopping for good folding tables can be overwhelming as there are thousands of them out there. So, to reduce the stress and time shopping, we have chosen Top 10 Most Affordable Folding Tables for Camping of 2019. Check out our reviews below! Landing on tenth on our list is OUTRY Lightweight Folding table. It is perfect for indoor use as well as outdoor activities such as camping, backpacking, picnics, beach party and traveling. 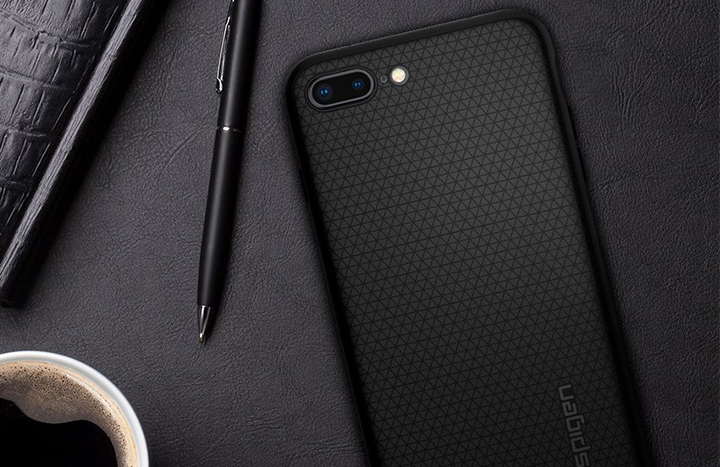 It features anti-slip rubber feet to increase traction on various surfaces and adds cup holders on the table top to avoid accidentally knock over your bottle. There are 4 bottle holders for size L and 2 for size M, the hole is 2.76-inches in diameter. It is heavy duty table as it is manufactured of ripstop 600D nylon fabric table top and lightweight aluminum alloy frame. OUTRY tables are only 1.7 pounds for medium size and 2.6 pounds for large size, making them very convenient to carry and ideal for any outings. A carrying case is included in the package. With OUTRY you can have your folding tables out anytime and anywhere. Next up is KingCamp multi-purpose bamboo folding table which a product from KingCamp who manufactures and distributes of outdoor gear in more than 38 countries all over the world. It is perfect to be used in kitchens and outdoor activities such as picnic, camping, beach, patio parties, fishing. The table legs can be adjusted, any height from 17 to 25.6 inches, for different height chairs to suit your needs. It is very stable and it is manufactured Anti-UV water resistant bamboo desktop and aluminum frame, making it a very sustainable product as bamboo is almost an unlimited resource. You can open and fold this KingCamp multi-purpose bamboo folding table in seconds. A carry bag with handle included in the package along with the 25.6″ x 4.3″ x 5.5″ folding table. Go for space saving and portability, Go for KingCamp. This is Goplus Folding Table which is ideal for picnics, camping, fishing and almost any kind of outdoor activity. Table legs are foldable and can be folded easily. It is very unique with a sink and faucet built-in. Its tabletop is designed with a sink and a superior curving designed stainless steel faucet for washing food conveniently. A length adjustable drain hose and a stopper for the sink are included in the package. It is consists of a high-density plastic tabletop station and durable metal table legs, which ensures its long-term stability and durability. It used authentic materials and has 200-lb weight capacity. The drainage hose can be taken apart from the table. Length of it can be adjusted from 8.7” to 28.3” so you can adjust the height to suit situations. There is a drain designed with 6 holes in the sink. You can be reassured to wash those small fruits or vegetable such as grapes and cherry tomatoes. No need to worry whether they will slip into the drain. A stopper is also included. Goplus will create a whole new experience for you and your family at your next destinations. 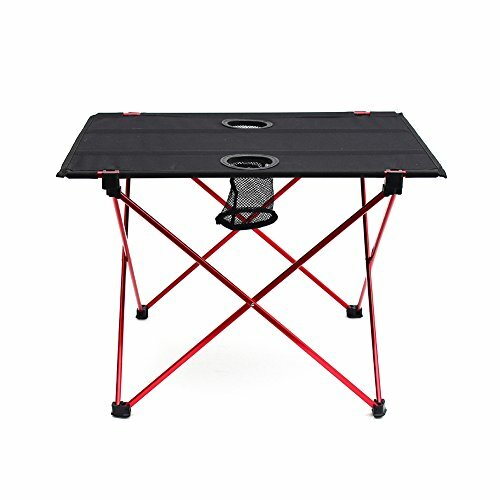 With this light-weighted portable camping table, you can fully enjoy your time, whether you want to go fishing, picnic, outdoor recreation activities or just sitting there with your friends drinking and talking. The table is roughly the height of an adult’s knee height which is extremely approachable! This table pairs well with all portable camping chairs. This camp table top is made of Aluminum. You can place books, drinks, and food on it at the same time without any problem, the product can take up to 15 kg. 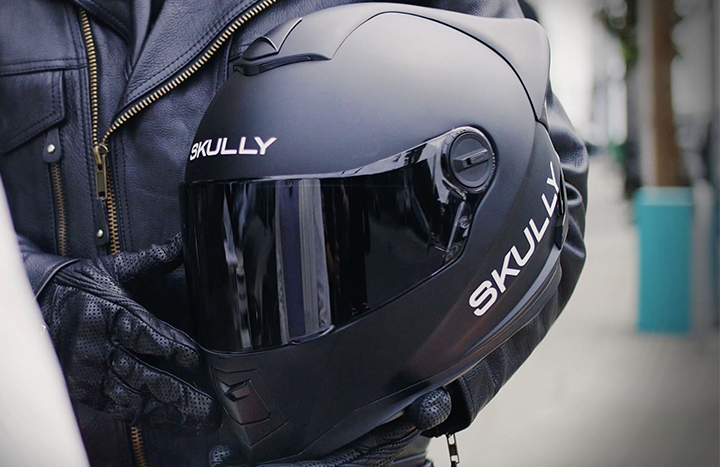 It is waterproof as it is manufactured from aluminum. It is bright and waterproof, no tablecloth needed thus you never need to worry that you have left it on the patio when it is raining outdoors. 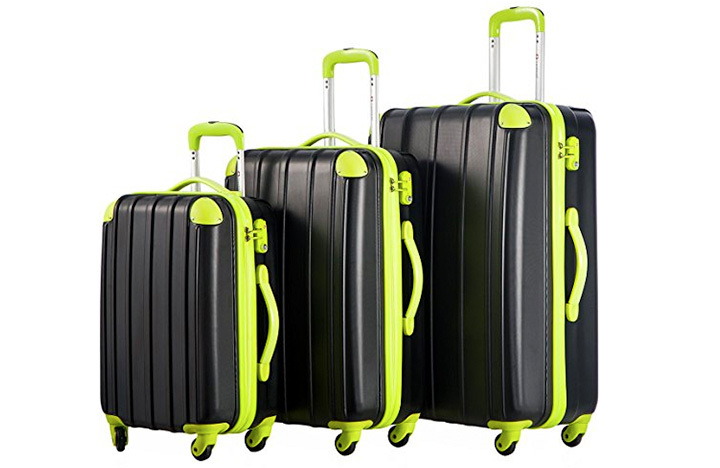 It is sturdy because of the mechanical design, it can hold up to 15kg without any problem. You can put books, laptop, drinks, and food all on it. It is easy to install; you can get the camp table up in 1 minute and take it down in 30 seconds. Take Trekology on the go, enjoy your time! This CampLand folding table is made of high quality of the aluminum, and it has large storage spaces. It is easy to carry and transport. The height of the table is adjusted by 12.7 inches, you can find a suitable height when you use it. The surface of the foot has been oxidized treatment, so it will not be damaged by moist environment (indoor air-conditioned microclimate and outdoor humidity). 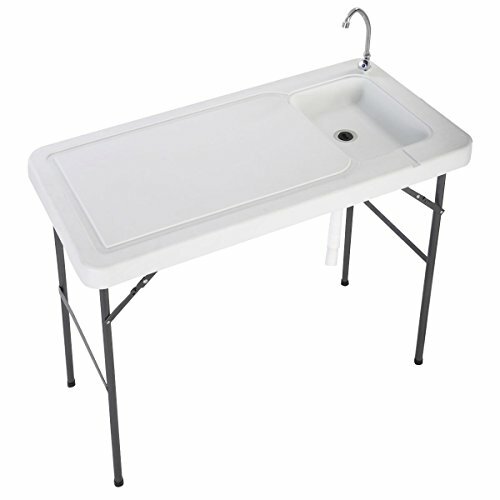 It is durable, waterproof, stain-resistant and easy to clean up because it is made of aluminum frame and MDF table top. Its overall dimensions of 15.7” by 24” by 10.4” and lightweight of 4.4lbs makes it easy to fold and transport. 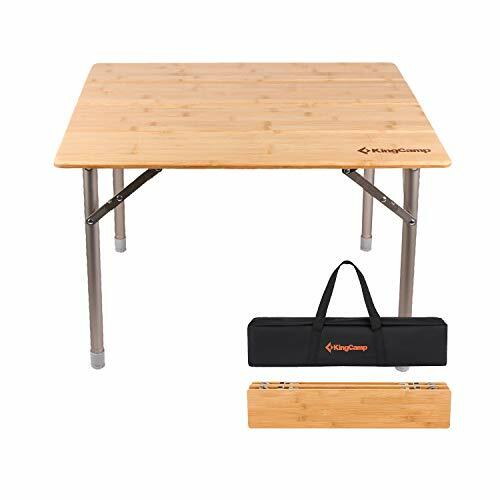 This folding table will give you satisfactory applicable effects for both indoor and outdoor activities such as camping, picnics, barbecues, backyard parties, etc. CampLand is very confident you will love their product so enjoy lifetime warranty and 100% money back guarantee if you are not satisfied! 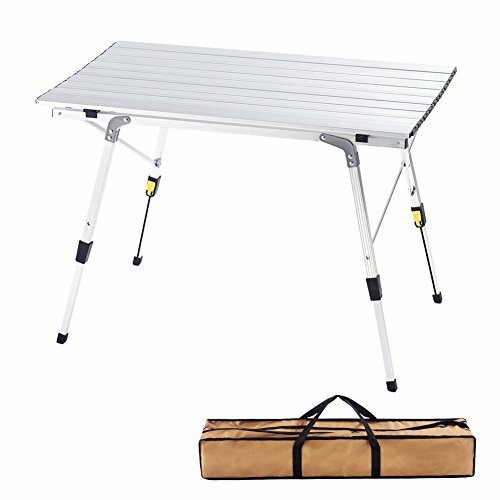 KingCamp lightweight portable aluminum alloy roll up top folding table is perfect to be used indoors, or bring it to outdoor activities for picnic, camping, beach, patio party, fishing, and more! Steel frame provides a weight capacity of 176 lbs. Heat-resistant aluminum slat top provides a stable, rigid work surface and dining area. Don’t hesitate to put a grill or oven on the table and enjoy your barbecue time! The desktop is made of aluminum alloy and anode oxidation treatment, no rust, corrosion resistance and easy to clean up. With the split type design for the board and bracket, the desktop can be rolled up and the steel frame with safe lock can be folded. The table can be folded to the middle from left and right. Aluminum construction saves on weight. It is 14.6 lbs and the size only has 42.5 x 9.1 x 4.3 inches after folded. The table is portable and light enough to be carried around your trip, fits most car trunks. The Oxford carry bag is included, making it easier for you to carry. If you are looking for a table that is quick and easy to set up, has room for your drinks and still room for games, and is lightweight the Eclipse Table is the one for you. You simply buckle the straps at each corner and adjust them to allow the tautness that you prefer. Since there are two layers, the lower level has 4 built in beverage holders so you don’t have to worry about your drinks getting knocked over while you’re eating or playing games and the top level is flat for your other activities. There is no more worrying about your drinks spilling on your cards or being in the way of a fast paced game. When it’s time to head home, unlatch the buckles, and slide the table into the included carry bag and you’re set for your next outing. The table comes with checker game board and pieces with dimensions of 27″ L x 27″ W x 26″ H. ALPS is confident of this folding table and offers lifetime warranty. The Deluxe Folding Grilling Table is a must-have accessory for any tailgate, party or camping trip. This spacious grilling table has a lightweight, high strength steel frame and an aluminum table top. The table is quick and easy to set-up. 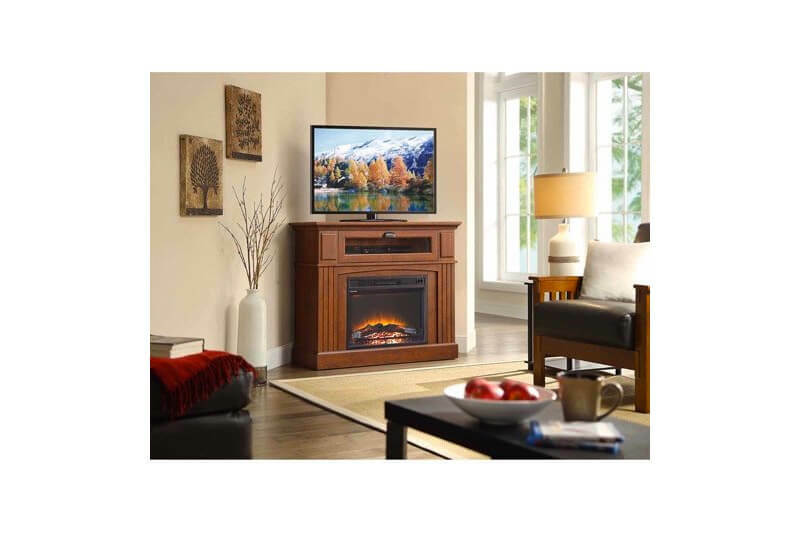 It is great for RVing, picnics, camping, sporting events and backyards. You can set-up is a breeze; in less than a minute you’ll be ready to start grilling. Its large tabletop is 58-3/4 inch x 19 inch x 32 inches and 2 side shelves of 17 3/4 inch x 15 3/8 inch each and lower shelf of 7 3/4 inch x 21 3/5 inch which offers enough space for all of your cooking gear. Additional hooks and paper towel holder on the side are included to hold all of your grilling utensils. 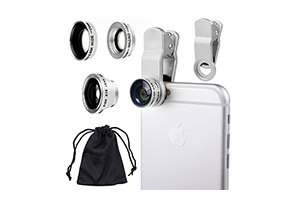 By folding down to only 6 inch tall you will save valuable storage space. Also includes a convenient carry bag for storage. It is lightweight – weighing in at only 27-1/2 lbs. Have Camco Deluxe Folding Grill Table with you and you can enjoy grilling wholeheartedly. After a long hard day trekking you need a table that can take what you throw at it. A place to drop your gear—cook a meal & enjoy a hot beverage. In comes the Tao folding table that combines unsurpassed beauty, mobility and practicality without compromising its integrity. Unlike wooden or nylon-top portable tables, the aluminum table top is waterproof, weather-resistant, and easy to wipe clean. This table is built with an aerospace-grade aluminum alloy that is coated with beautiful metallic colors. Rugged enough for all your outdoor needs—Backpacking, Camping, BBQ’s and Picnics. Trekology’s sturdy construction supports heavy tasks such as cutting and cooking, allowing you to head outdoors and go further for longer. The largest table weighs only 4lbs – substantially lighter & more durable than comparably-sized wooden tables. It folds into the included carry bag. Trekology provides a stable work surface for hobbyists—unfolding to a surface area of 27’’x18’’ and stops at roughly adults’ knee height. 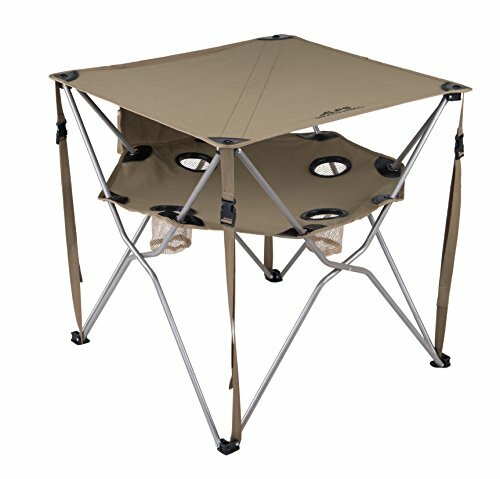 Suitable height for camping chairs/stools, or even sitting on the ground. No tools needed! The aluminum base frame is designed to pop up and fold with ease. Its unique hinge design enables easy and robust connection to the table top. Trekology Table is built for portability and stability. Now you can cook meals, prepare drinks, play cards or enjoy your morning cup of tea! Landing on the number 1 spot among the best folding tables for camping is Coleman Compact Folding Table. The Coleman Compact Folding Table offers enough seating room for four in a lightweight, ultra-portable design. 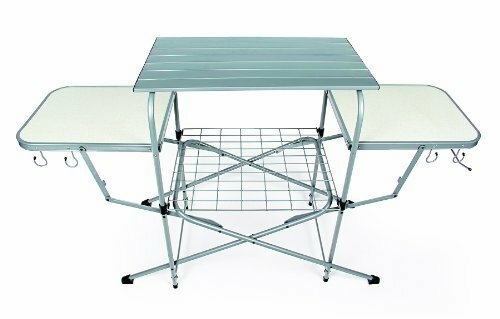 Ideal for camping trips, picnics, and barbecues, this sturdy aluminum folding table snaps together and disassembles with ease. Setting up is simple: just unfold the frame, snap the top onto the frame, and ensure that the table is resting on steady ground. 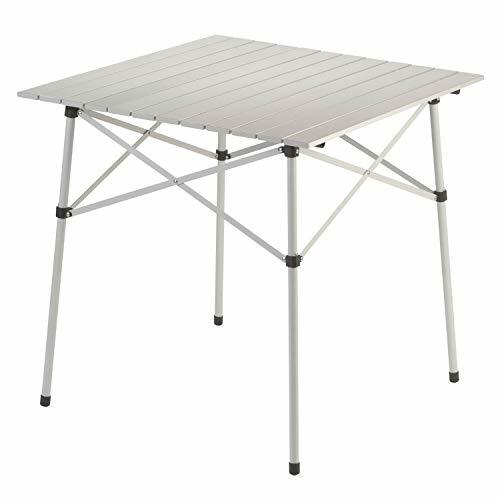 The strong steel frame and aluminum top supports plenty of weight, making this folding table suitable for a wide variety of outdoor applications, whether you’re playing cards at the campsite or cooking in the backyard. Its snap-together design allows you to assemble and fold up with ease. When it is time to head home, the slat top and frame easily fold up and store in a carry bag that is as small as an airplane carry-on. Take Coleman Compact Folding Table along to your outing for comfortability, portability and convenience! We hope our Top 10 Most Affordable Folding Tables for Camping of 2019 Reviews has been a helpful shopping guide to you insightful tips when choosing a folding table. Having a folding table with you whether at home or outside will definitely come handy to you. You can have them out for occasional parties or gatherings e.g. Thanksgiving, New Year’s Eve etc or for young kids then fold and store them away safely. Or you can use them for your family picnic or camping. You can now purchase one or more of these folding tables for your house! Have fun with our Top 10 Most Affordable Folding Tables for camping of 2019 and surely a lot more fun with your loved ones beside you!